The most exclusive combination of luxury and security designed for your enjoyment.  Located in the northwest of Madrid, in the city of Pozuelo de Alarcón, just 10 minutes from the center of the capital, LAFINCA LGC3 (Avenida de Luis García Cereceda) is located in a privileged setting. Framed in LAFINCA, it is part of the most select, exclusive and secure residential complex in Spain. With the spectacular LAFINCA Country Club at its feet, which will include the new great golf course in Madrid, along with a 35,000 m² lagoon, LAFINCA LGC3 will enjoy a superb setting. The golf course, with an 18-hole, par 72 field, 6,505 m in length, will host the most demanding professional tournaments, while the lagoon will allow the practice of water sports or relaxing on its beaches of fine sand. The most exclusive environment for exceptional residences. In “LAFINCA” you will find a discreet and quiet atmosphere where you will enjoy absolute privacy. Enjoy restaurants and spaces for events such as In Zalacaín, Casa Tere or Urrechu, sports facilities such as the Somosaguas Golf Club or the Reebok Sports Club and shopping centers such as El Zoco or El Zielo, in which you will find the most exclusive brands. Nearby you may also enjoy the heart of Pozuelo, the leisure complex Kinepolis and Avenida de Europa, with the best shops, bars and restaurants. You will have access to high-level sports facilities such as the Reebok Sport Place, with over 25,000 square meters devoted to a large number of sports activities, wellness, health and beauty, the Valle de Las Cañas Sports Center or the Pozuelo Sports Club. 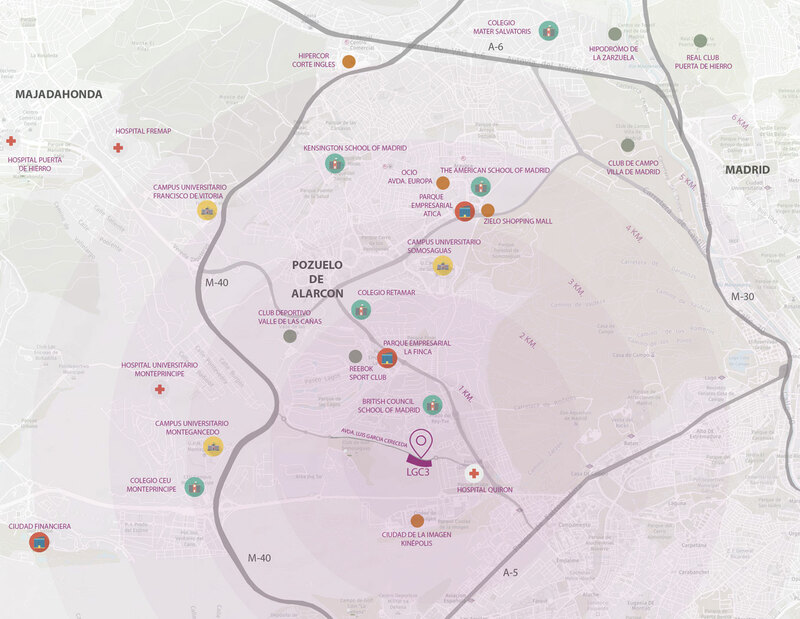 Next to one of the main hubs of motorways and ring roads of the capital, “LAFINCA” has direct access to the most complete transport network, including the Adolfo Suárez Madrid-Barajas international airport. In addition, it has the best public transport services, with access to the railway and light rail networks, and the intercity bus network connecting every 10 minutes to the center of Madrid. *Project subject to changes. All the contents of this website are based on a project and are purely informational, non-contractual and non-binding, and may experience changes by a decision of the owners or by technical, legal or administrative requirements. LAFINCA is the most select, exclusive and secure residential complex in Spain. It offers an urban concept in which excellence, protection and comfort reach heights hitherto unknown in our country. Designed for its inhabitants to enjoy the best quality of life, in a quiet and discreet atmosphere in which to experience absolute privacy, LAFINCA is the most privileged combination of luxury and security. And the pursuit of excellence brings us a step further. LAFINCA LGC3, in the context of the development of the Casablanca area, has a unique and truly exceptional setting, unfolding as far as the eye can see. All residences face the midday sun, and a magnificent view of the exclusive LAFINCA Country Club. 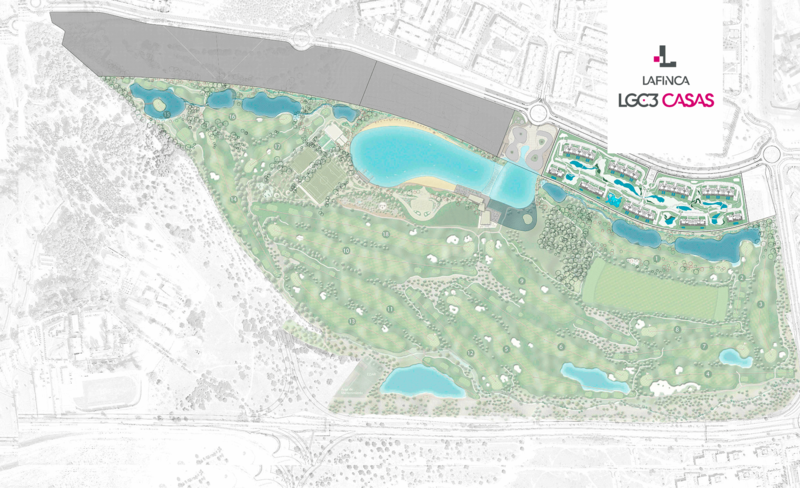 LAFINCA Country Club will include the new great golf course in Madrid, along with a 35,000 m² lagoon. The golf course, with an 18-hole, par 72 field, 6,505 m in length, will host the most demanding professional tournaments, while the lagoon will allow the practice of water sports or relaxing on its beaches of fine sand. After more than forty years heading the luxury real estate industry, “LAFINCA” is synonymous with exclusivity, quality and cutting-edge design. An accomplishment reached from a solid base, each one of our projects offers our clients excellence taken to its maximum level. LAFINCA LGC3 is conceived as a work of precious craftsmanship in the intersect of the advantages of a single-family home and group housing. Exclusivity, comfort and safety, the backbones of our urban concept, reach heights hitherto unknown in our country. Embedded in a matchless scene, it has 42,000 m² of private gardens while enjoying unlimited views toward LAFINCA Country Club, turning day-to-day into a unique experience. In LAFINCA LGC3 you will enjoy a discreet and quiet environment with absolute privacy, guaranteed by extraordinary security measures to offer the exclusivity that you and your family deserve. 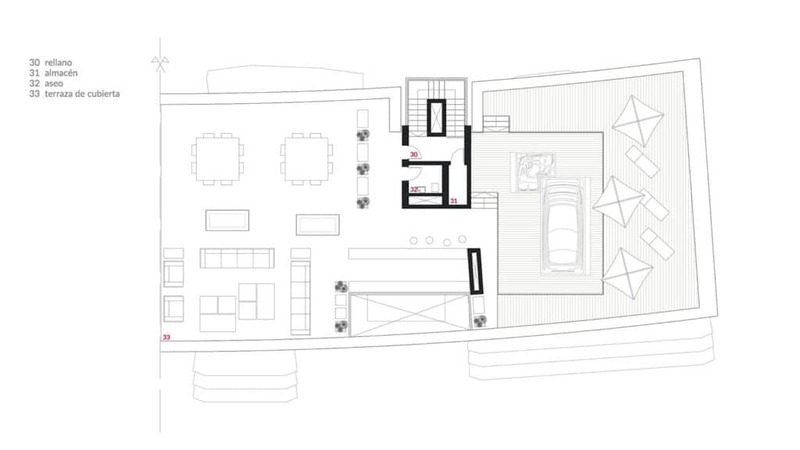 Each of the 144 residences of LAFINCA LGC3 has been designed with care at every detail. A design in which natural light is foremost, together with the open views enjoyed by the residences and the large terraces, contribute to a blurring of boundaries. 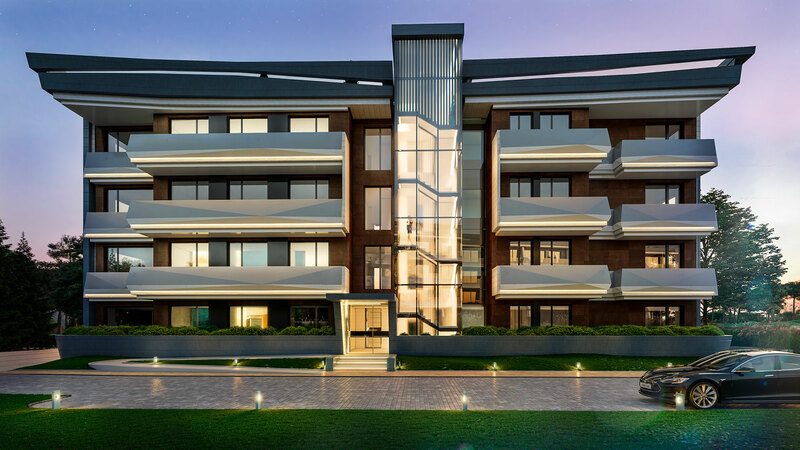 Double north-south façades, interior and exterior architectural design, wide, modern and versatile spaces, as well as the most exquisite selection of materials and finishes or the very high energy efficiency, are just some of the features of our residences. LAFINCA LGC3 is an oasis of greenery and landscaping precisely designed to protect the privacy of the owners while maintaining the beauty of the surroundings. Its grounds are crossed by winding streets and promenades through beautiful lakes and gardens. They are ideal for walks and for the practice of hiking or running. They also feature a swimming pool with all additional facilities and with a large play area for children. All is guarded by extraordinary security measures that guarantee the maximum safety and peace of mind. The grounds will be double-fenced, with intrusion detection systems and a control booth. The commitment of LAFINCA with our environment and with low resource consumption has entirely marked the project. 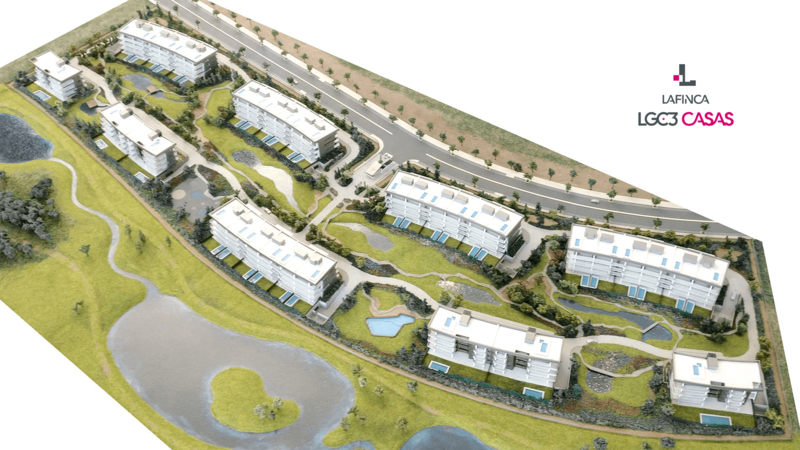 Species of low water consumption have been selected for landscaping, and the automatic irrigation system provides for the recovery of gray water. 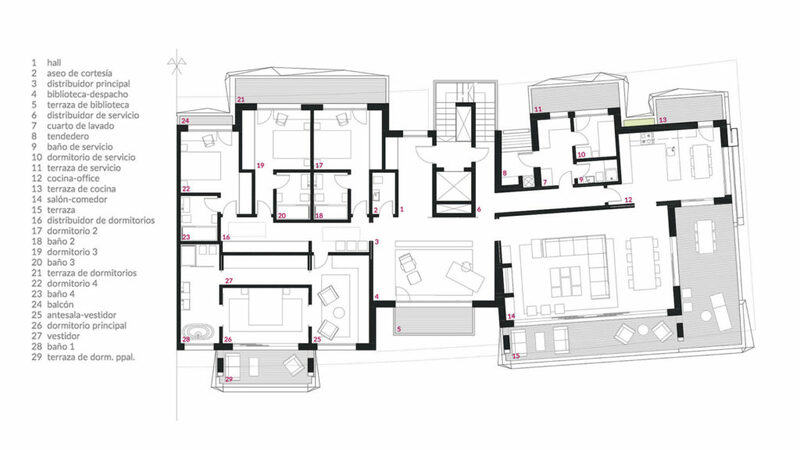 Residences at LAFINCA LGC3 have been designed under the premise of being exceptional from all points of view. 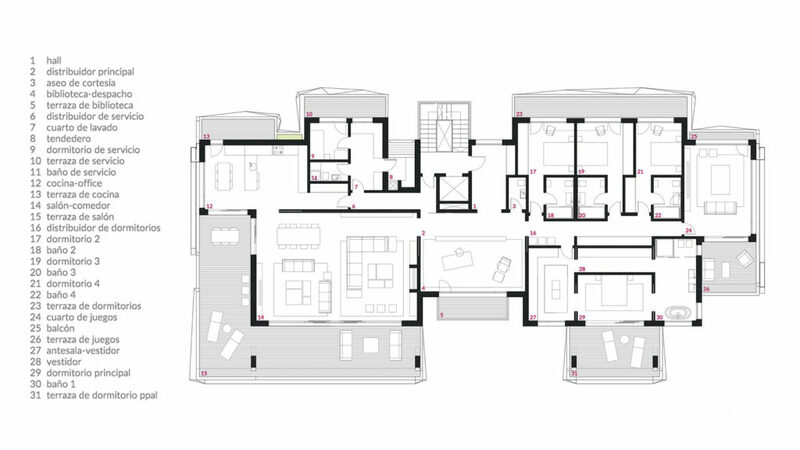 A very careful architectural design offers versatile residences fitting like a glove the various circumstances and lifestyles of our clients. Special care has been focused on achieving the highest spatial and constructive quality, as befits residences aiming at excellence. 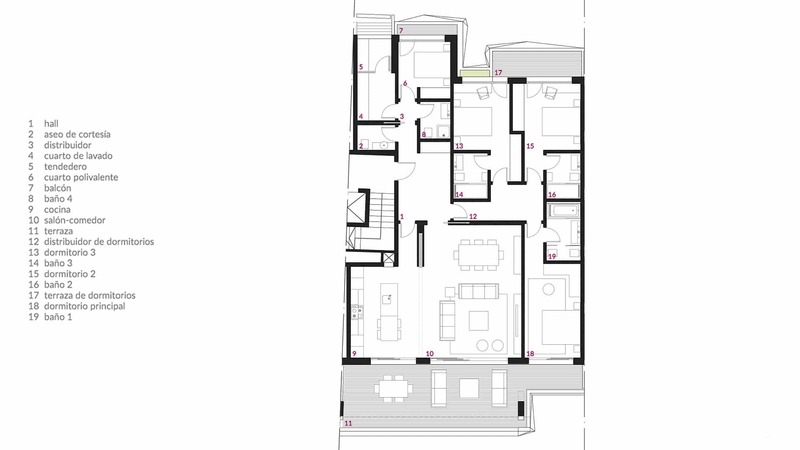 Their surface are varies from some 200 to 400 m², with generous terraces that may reach over 600 m² in some cases. All residences have double north-south façades and large windows opening to wide terraces and endless views of gardens and landscapes. Light has an undisputed major role in each of the spaces, and all finishes and materials are of the highest quality. 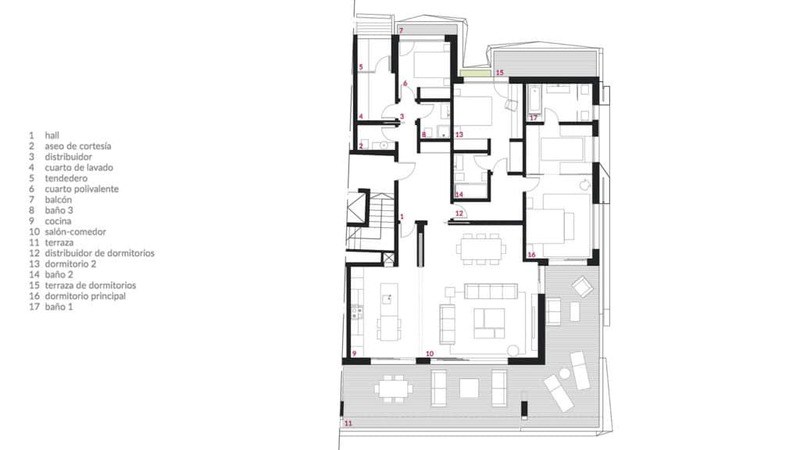 Standing at the forefront, the only way we know, all residences will include a domotic installation allowing you to monitor, among many other things, lighting or air conditioning from anywhere. The commitment of LAFINCA with our environment and with low resource consumption has entirely marked the project. The best architectural solutions have been chosen in external walls to minimize energy losses, and centralized heat and cold generation with geothermal energy was adopted, a trailblazer in the industry, with very high performance and very low power consumption. In their homes our customers will enjoy underfloor heating in winter and cooling in summer, with the support of fan coils, and always with regulation by areas. In the same vein, garages will have electrical outlets for vehicles in some of the 3 to 6 parking spaces for each residence.